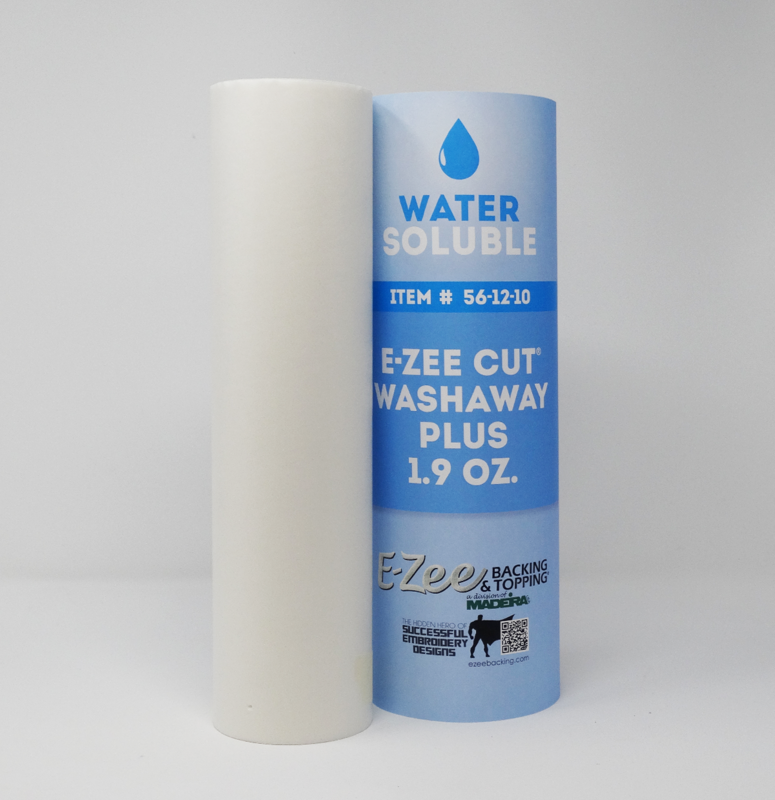 E-Zee Cut® Washaway Plus 1.9 oz. is a soft and sheer water soluble stabilizer with a pressure sensitive adhesive. The highly sophisticated adhesive works well with a variety of fabrics. It can be repositioned as needed and is fabric and needle friendly. It is ideal for hoopless embroidery, as well as for embroidering on Lycra® and other highly stretchy fabrics. E-Zee Cut® Washaway Plus 1.9 oz. is eco-friendly! Be sure that your hands and work area are completely dry before handling. Cut a piece from a roll of E-Zee Cut® Washaway Plus to fit your hoop size. For very stretchy fabrics, pull the release paper off and apply the adhesive side directly to the reverse side of the garment and then hoop together. For hoopless embroidery, hoop the stabilizer alone with the release paper facing up. Expose the adhesive by carefully scoring an X pattern with a straight pin. Remove the paper within the hoop by pulling from the center out. Position the fabric by pressing onto the adhesive. Embroider the design and remove the embroidered item from the hoop. Trim the loose, excess stabilizer with a sharp pair of scissors, leaving some excess stabilizer around the out side of the design. Dissolve by submerging in liberal amounts of warm water and apply slight agitation. You may also run the embroidered item through a delicate wash cycle. Due to irregular water conditions, it may be necessary to repeat this step. Store unused E-Zee Cut® Washaway in a dry, airtight container.